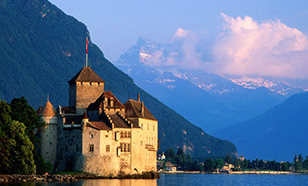 Why Book Switzerland Tours with Us? Switzerland is one of the top tourist attractions in the world and a major honeymoon holiday destination, simply because it has romance written all over it. There is such beauty in Switzerland that you can only take in all of it gradually. At Tour My India, we offer you outstanding vacation packages to Switzerland which ensure that you have a trip filled with adventure and entertainment. Your sightseeing tour with us shall include azure lakes, Swiss castles, meadows, lakeside hamlets and other places with surreal beauty. Whether you are planning a family trip or honeymoon holiday, you can be sure of having a good time with our Swiss tour packages. A honeymoon vacation spent here brings all your fantasies to life, especially as you visit top romantic hotspots like St. Moritz, Bern, Geneva, Lucerne and Montreux. 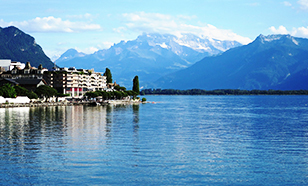 Various tourist places which you must see like The Matterhorn, Jungfraujoch, Lucerne, Interlaken, Bern and Lake Geneva, are also included in our vacation packages to add that extra edge to your perfect holiday in Switzerland. For adventure buffs, we offer numerous and exciting opportunities in Switzerland like paragliding, skiing and hiking trails. We also take care of all your other arrangements while you have a gala time without any distractions and inconveniences. Every time you book Switzerland tour packages from Tour My India, you can be assured of receiving outstanding services and having a fun-filled trip. We put our client’s satisfaction as our highest priority and ensure that all their needs are attended to. In addition to our regular packages, we also offer customized travel packages in Switzerland that let you plan a trip according to your preferences, while we ensure that you have the best vacation in Europe. 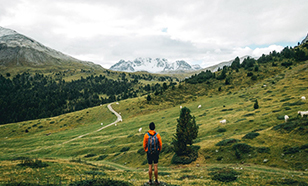 From accommodation to transport, we take care of all your travel requirements even as you go cycling, hiking, shopping or doing any of the other activities in Switzerland. Need more reasons to book your Switzerland tours with us? We offer you the option of visiting this picture-perfect postcard country at outstanding prices and lucrative deals that you won’t come across anywhere else. This is because we at Tour My India know that visiting such a place is a once in a lifetime experience, and you should make the most of it. Interlaken is one of the top tourist attractions in Switzerland, and is snuggled between Lake Thun to the west and Lake Brienz to the east. The main promenade, Hoheweg, is dotted with flower gardens, hotels and cafes. You can also enjoy a ride to the countryside with the mountain railways, ski lifts and cable cars. While paragliding is popular during the summer, cross country skiing is all the rage during winters. 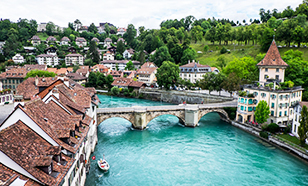 Lucerne looks like a city still stuck in time, with its waterfront promenades, covered bridges, historic buildings with their curious frescoes and delightful fountains. The Chapel Bridge is the most famous landmark, while the Lion Monument, with its sculpture of a dying lion, turns heads regularly. For lovers of history, there is the Swiss Transport Museum, with its numerous exhibits and a Planetarium. Enjoy a cruise to Mt. Pilatus on a cable way or a ride to the Dietschiberg on a funicular. 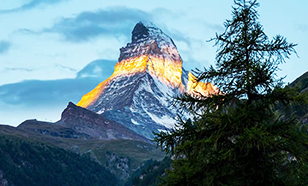 The Matterhorn kisses the skies at 4,478m and proclaims its superiority as the highest mountain in the Alps. During summers, ardent climbers attempt to scale its peak. At its base lies the quaint village of Zermatt, an excellent resort boasting horse drawn carriage rides, world class hotels and restaurants and gorgeous chalets. Come summers, and hiking, climbing and biking are all the rage, while skiing gets tourists going during winters. 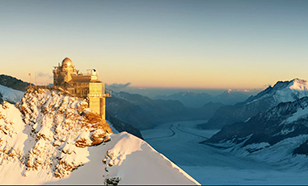 The alpine wonderland that is Jungfraujoch stands at an elevation of 3,454m and weaves its magic on you from the moment you reach it. This is where the Great Aletsch Glacier, a UNESCO World Heritage Site, begins. You can have a gala time at the Snow Fun Park or enjoy the thrilling views from Sphinx Observation Deck. It is also home to curious sounding names like Restaurant Bollywood which specialises in Indian cuisine and offers incredible views of the longest glacier. Lake Geneva is pervaded by the joyful spirit so intrinsic to French culture while displaying marvellous specimens of Swiss structure. The European seat of the United Nations, it is dotted with promenades, parks and gardens. You can enjoy a leisurely stroll in the old town, which is home to numerous historic buildings. One of the famous landmarks is the Jet d’Eau, with famous cultural attractions being Opera House and Grand Theatre. Come face to face with Swiss traditional culture in its cobbled streets, cathedrals and fountains dating back to the 16th century. In its old town, a UNESCO World Heritage Site, you experience an old world charm. Famous attractions are the Zytglogge medieval clock tower with moving puppets along with shopping arcades called Lauben which stretch to a distance of 6km. Art lovers can flock to the Bern Museum of Art, while the Bear Park is a wonderful hangout for families. 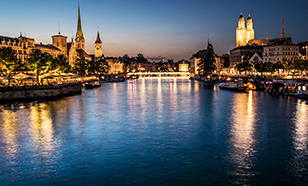 Zurich is Switzerland’s largest city and also a cultural reservoir. A major tourist hotspot is the Old Town, with its galleries, cafes and shops. Shopping enthusiasts find their true calling at the Bahnhofstrasse, one of the world’s most expensive shopping avenues. Art and culture lovers are in for a treat, as there are more than 50 museums and 100 art galleries scattered across the city. 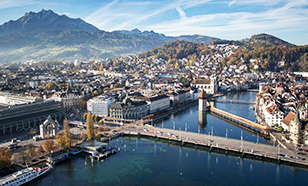 Explore swiss history at Swiss National Museum or enjoy a visit to Zurich zoo. Chateau de Chillon has inspired writers and artists for centuries. Lord Byron, Rousseau and Victor Hugo, no one remained immune to its charms. The chateau complex houses around 25 buildings spread over 3 courtyards. Some of the main attractions to watch out for are the Chapel, Great Halls and Camera Domini. The Gothic underground rooms are an attraction in themselves. It is visited by more than 4,00,000 guests every year. 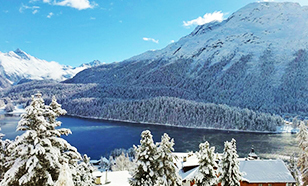 Located at a height of almost 1,800m, St. Moritz is one of the most famous mountain destinations in the world. It is divided into two parts, St. Moritz Dorf and St. Moritz Bad. Lakes, glaciers, snow capped mountain peaks and expensive restaurants lend it a style exclusive to this country. Winter sports enjoy an enormous popularity here, with skating, bobsledding and skiing being favorites. In the summers, glacier skiing, hiking and biking gets the tourists going. 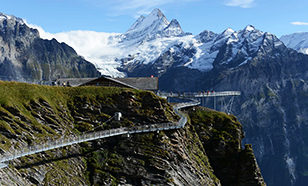 Swiss National Park was founded in 1914 and is spread across an area of more than 170 sq. km. The landscape in this park is defined by pine forests, shrubs, merrily flowing rivers and limestone crags. There is a large network of trails which are enticing to the nature lovers. It is home to an astonishing 5,000 species of wildlife, with the prime attractions being red deer, marmot, chamois and ibex. 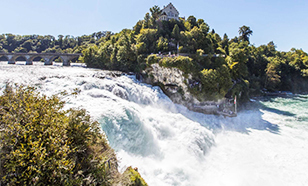 At The Rhine Falls, you don’t just listen to the water roar, you can also feel its vibrations. Its origins go back to about 15,000 years. Stretched across 150 meters, they are the largest waterfalls in Central Europe and are best visited from June to July. You can also enjoy the views of the waterfall from up close via a boat ride, apart from the viewing platforms located on both sides of the river. Lake Lugano is a lake in the city of Lugano which is a part of the Italian speaking canton Ticino. 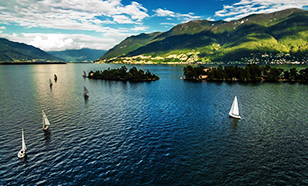 Lake Lugano is situated on the Swiss and Italian border in Ticino, which is one of the Italian speaking cantons in the country. Here, you are offered a glimpse of the Mediterranean lifestyle, along with the food items like palms, figs, pomegranates and citrus. The southern shores of the lake are extremely rich in fossils, some of which date back to mid-Triassic era. Mt. Pilatus is an enormous mountain range which overlooks the city of Lucerne. Its highest peak is Tomlishorn, situated at a height of 6,982ft. There are several way to reach its peak. 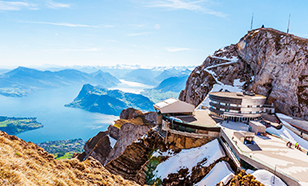 You can reach the peak with the Pilatus Railway, which is also the world’s steepest cogwheel railway. Two other peaks close to the station are Esel (located at a height of 6949ft) and Oberhaupt (located at a height of 6906ft). The village of Grindelwald is a hotspot for adventure and sightseeing. 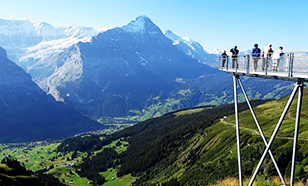 Situated in the Bernese Alps, it is popular for skiing in winter and hiking in summer. The alpine pastures of Grindelwald, along with its glaciers and lakes, make it a dreamy paradise come true. It has also served as a filming location for movies like Star Wars and James Bond movies. During the winters, it offers dozens of kilometers of ski trails and sledging. 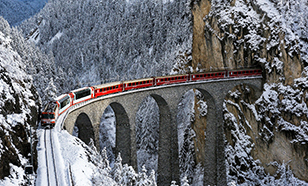 Sit back and enjoy the ride aboard Bernina Express as it takes you past various spectacular sceneries. This gracious train ride treats you to different faces of Alpine panorama. The route of the train covers 55 tunnels, 196 bridges and inclines with the least exertion. A highlight of the train ride is when you reach the topmost point at 2253 meters above sea level. Here, you can enjoy incredible views of the Alpine surroundings.